We used all packaged veggies (baby carrots, frozen pearl onions and jarred artichoke hearts) to make this Mediterranean-inspired roast chicken a convenient Sunday supper choice. Luscious honey-mustard pan gravy adds to the appeal. If you like, serve with Herbed Brown Rice, use the leftover chicken and rice to make Easy Chicken Gumbo later in the week. Preheat oven to 375 degrees F. Rinse chicken body and cavity; pat dry with paper towels. To truss the chicken, pull the neck skin over the opening and secure it to the back with a small skewer. Using 100-percent-cotton kitchen string, tie the drumsticks together. Fasten the drumsticks to the tail if present. Twist wing tips so they rest beneath the chicken (behind the back). Place chicken, breast side up, on a rack in a shallow roasting pan. Insert an oven-safe meat thermometer into the center of an inside thigh muscle. Do not let the thermometer stem touch the bone or the pan. In a small bowl, combine olive oil, lemon juice, thyme, garlic salt and 1/4 teaspoon pepper. Brush oil mixture over the chicken. Arrange carrots and pearl onions around chicken in pan. Drizzle vegetables with the melted butter; season with salt and pepper. Roast, uncovered, for 1 hour. Add drained artichoke hearts. Continue to roast 30 minutes to 1 hour more or until the drumsticks move easily in sockets and chicken is no longer pink (180 degrees F). Remove chicken from oven and transfer to a cutting board. Cover loosely with foil; let stand for 10 minutes before carving the chicken. Transfer the vegetables to a serving bowl; keep warm. While chicken stands, prepare sauce. For sauce: Pour pan drippings into a large measuring cup. Scrape the browned bits from the pan into the cup. To skim fat, tip the measuring cup and use a metal spoon to carefully remove the clear fat that rises to the top; reserve fat from the drippings. In a small saucepan, heat 2 tablespoons of the fat (if there is no fat, use 2 tablespoons butter) over medium heat. Stir in flour. Add enough chicken broth to remaining drippings in the measuring cup to equal 1 cup liquid. Add broth mixture and milk all at once to flour mixture in the saucepan. Cook and stir over medium heat until thickened and bubbly. Cook and stir for 1 minute more. Stir in mustard, brown sugar and Worcestershire sauce. Carve the chicken. If you like, reserve half the chicken for Easy Chicken Gumbo). Store reserved chicken, covered, in the refrigerator for up to three days. 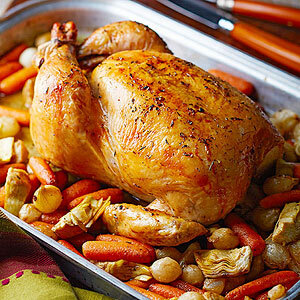 To serve, spoon the sauce over the remaining carved roast chicken and vegetables. Serve with the Herbed Brown Rice. A whole roasting chicken makes better roast chicken than broiler/fryers because of their relatively larger size, the higher fat content makes them just right for cooking evenly in the oven and their meat is also more flavorful.